From Aspiration’s democratisation of investing with a focus on social good, and Spain’s La Caixa loved by the people of Catalonia … to Moven’s money management concept launching in New York, and Zidisha enabling peer to peer lending for African entrepreneurs … the future of banking is different, and increasingly diverse in format. In the past, every town centre had its bank, with a queue of people and bars between you and your money. In fact you were lucky to even get there, given that they only opened when everyone was at worked. Even today, most banks still seem antiquated. They work hard to hide the best deals from customers, and simple transactions presumably requiring only a few keystrokes, like an international payment, can take a week. Whilst it was the greed and incompetence of corporate banking that drove the world to financial crisis, most customers see the whole banking system as opaque and not to be trusted. The next generation of banks do things differently. They have no time for these out-dated practices. They design their services around the customer, less interested in outwitting innocent account holders with complex schemes and random charges, instead focused on (as a Visa ad campaign said) helping your money to flow smoother, and life to flow better. They focus on adding value to people’s lives, where money is an enabler, applying and embedding finance into richer lifestyle experiences, be it for managing your home, shopping, travelling or entertainment. The best ideas often emerge from low tech environments. When Safaricom started operating a system of text-based promises to pay, M-Pesa emerged as a digital currency for Africa. Eventually the major players like Visa followed suite with V.Pay. More generally, the smartphone is seen as the future of branches, creating everything you need to manage your money, anytime anywhere. Brett King, author of Bank 3.0 recently put his theories on the line, launching his own solution, Moven, entirely virtual. In the real world, the full service trend goes beyond a smile, pioneered by Umpqua Bank where Ray Davis created a fusion of Gap, Starbucks and Ritz Carlton hotels in the form of a boutique bank. When Richard Branson promised to make money fun, he created lounges and started serving cocktails. Somewhere in between these worlds are the kiosk formats, favoured by the likes of Citibank and Bank of America, providing convenience on each street corner, supported by video-based advisors. Many banks stand out by focusing on specific audiences, rather trying to be all things to all people with the inevitable confusion of complexity, or blandness of average. Alior Sync creating a social media enabled, gaming embedded, digital bank just for 20-30 year olds, Bank of Inner Mongolia targeting China’s wealthy mining region, Bank Nizwa of Oman, chose to focus on creating the state’s first Islamic bank. Silicon Valley Bank is specifically designed for entrepreneurs, and Indonesia-based Bank BTPN focuses on micro loans, and in particular its hugely profitable pension loans service. Once you are focused on a specific audience, it is much easier to do more for them, understanding their specific needs, and then linking to other partners who can offer a more complete experience. Finding a vacation to match your preferences and budget, or the best deal on your new car, is what customers do. This also opens up a wide variety of new channels and affinity brands through which to enable more. Consider, for example, you buy a new suitcase to go on vacation. Selling travel contents insurance, maybe on an annual subscription, is an obvious way to reach consumers “in context”. Or imagine you are hunting for a new house. It shouldn’t be hard to take out your smartphone, take a photo of a property you see for sale. With visual recognition, the house can be found on the database of estate agents and details pulled up. Connecting to your financial profile, funds available and credit scores, enables an instant assessment of whether it is affordable for you. Rather than the bank becoming the major obstacle to such transactions, it becomes the enabler. The question, however, is whether banks themselves will provide these human-centred, integrated and enabling interfaces, or whether other brands will embed banks within their richer, more inspiring financial and lifestyle experiences. Aspiration was born to be the financial firm for everyone. Because everyone deserves access to the best banking and investing products. Everyone deserves a financial partner they are confident they can trust. And everyone deserves to put their money in an institution that puts “good” ahead of “greed.” Profits are important. But what sets Aspiration apart is the belief that people are too. Our “Pay What Is Fair” fees mean we go to work every day committed to do great for our customers. And as a financial firm with a conscience, we are motivated by the mission to help you make money and make a difference at the same time. CommBank's innovative products and services are all about helping you to achieve more - to find a better home, to travel the world, to serve your customers better, to grow your business faster - its about more than money, its about you. DBS (the Development Bank of Singapore) leads the way in digital banking innovation, in Asia and across the world. It operates across 18 markets. We are an Asia-centric commercial bank focused on harnessing the region’s long-term potential as the centre of economic gravity shifts eastwards to Asia. Ezetap – The Square of India ... cashless payments in fast growth markets. "Over the next decade, India will move from a cash-based, opaque economy ... to an economy that is digital, instantaneous, and where every citizen is not just on the grid but the quality of their families’ future will be materially better" says Bobby Bose, cofounder of Ezepay. South Africa's FNB puts innovation at the heart of its culture. The bank’s innovative eWallet, hosted on your phone, acts as a hub for many other creative solutions to making money flow easier and faster. At last-an easy (and fun) way to pay pocket money, and teach your kids good money habits. goHenry is a Pre-paid, Pocket Money Card and App with unique parental controls, for young people aged 6 to 18. Marcus Goldman was a German banker, businessman, and financier. He was born in Trappstadt, Bavaria and immigrated to the United States in 1848. He was the founder of Goldman Sachs, which has since become one of the world's largest investment banks. However the bank has started to change its own game, entering the consumer market with "Marcus by Goldman Sachs". Kiva is an international nonprofit organisation, founded in 2005 and based in San Francisco, with a mission to connect people through lending to alleviate poverty. We celebrate and support people looking to create a better future for themselves, their families and their communities. M-Pesa became the mobile currency of Africa, embracing phones to do more than connect people, and improvising for the lack of infrastructure in fast growing markets. Macquarie is a diversified financial group providing clients with asset management and finance, banking, advisory and risk and capital solutions across debt, equity and commodities. The diversity of our operations, combined with a strong capital position and robust risk management framework, has contributed to our 49-year record of unbroken profitability. Moven is a digital financial manager designed around the mobile consumer, making banking and life easier, and through a range of easy and fun analytics, embracing games and social media, and even makes you a rockstar! Robinhood is the worlds most innovative financial services company ... with a mission to democratise access to the financial markets, with a simple smartphone app. Armed with a fresh $500 million infusion, SoFi is trying to shake up the world of finance by finding time to mix career coaching and even dating events in with your mortgage payments. Square’s insight came from the millions of small businesses who lose sales because they cannot accept credit cards. Empowering first the retailer, and the consumer, Square had to fight to change the rules of the market. 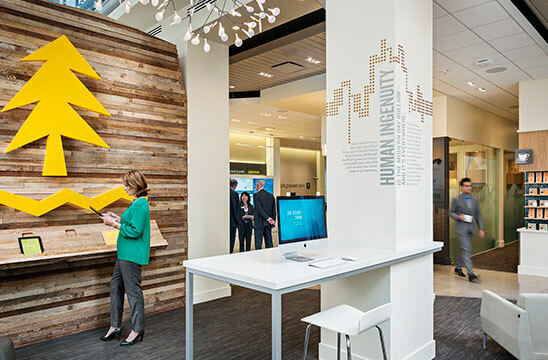 Umpqua Bank – Fall in love with "the world's greatest bank"
Umpqua reimagined the banking experience around customers, inspired by parallels such as Gap and Starbucks. A passionate focus on people and service has created a digitally-enabled physical experience like no other. Ping An, Tencent and Alibaba joined forces in 2013 to launch Zhong An, China’s first truly digital insurer. Zhong An is China’s first property insurance company that sells all its products online along with handling claims.